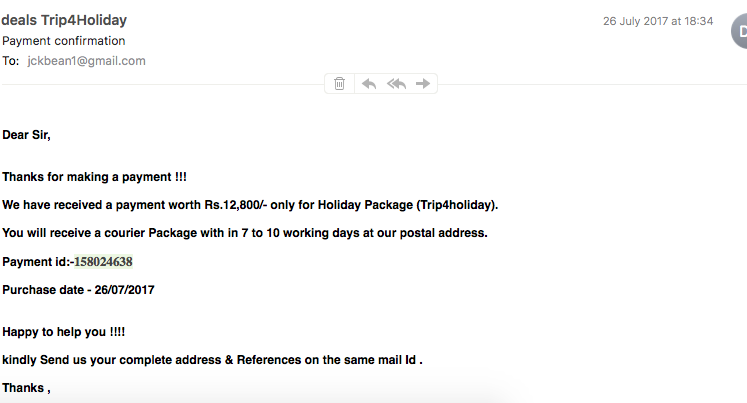 I was trapped by Trip4holiday.com from Noida on july 27th 2017 and they promised me a gift of DSLR Camera and a Samsung s8 Mobile with holiday for 6 persons. I paid 12800 rupees but then they disappeared without giving me anything.when I tried to call it says the number is not in use. NISHA called me in the begining to make me pay ,her phone number is 8377870919. What should i do to recover my money and bring them to justice.